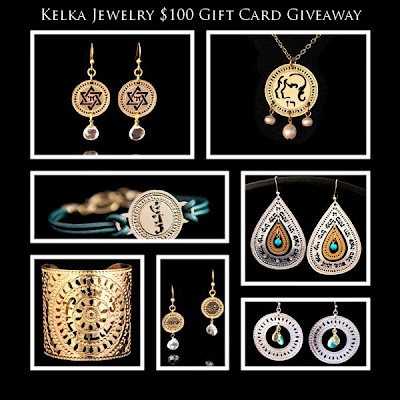 Kelka Jewelry $100 Gift Card Multiblogger Giveaway - Be Glossy In and Out! PRIZE: One lucky winner has the chance to win $100 Gift Card to spend at online Etsy store Kelka Jewelry! Kelka Jewelry has a collection of Gold jewelry as well as Kabbalah Jewelry, Judaica and gifts that are inscribed with Hebrew blessings and Hebrew prayers. All the products are handmade with love. You can check my review here. Disclosure: I did not receive any compensation for the publication of this post. All views are 100% my own and may differ to those of your own. The participating blogs are not responsible for the shipment of the prize. The host of the giveaway, Giveaway Route, will choose a winner randomly at the end of the contest and the winner will be notified via email. For questions, email Giveaway Route. Sigo en GFC como Maribeco Cp.